Matthew and I had the pleasure this summer to work with Dr. Henry Goldschmidt in having a library and archives session with the Religious Worlds of New York Summer Institute 2016 fellows. In addition to giving an overview of the resources at the Burke Library and elsewhere, we also had them look through the Department of Church Planning and Research records, 1855-1985. 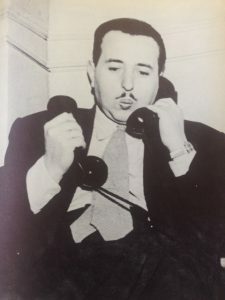 This was a great collection for them to look at since it contains a ton of reports largely compiled between 1930 and 1980 on practiced religions in New York City. Needless to say the uses of this collection are infinite in possibility! 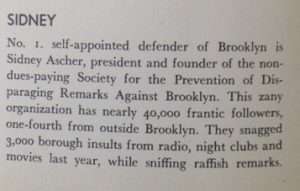 This collection is such a rich resource on the history of NYC’s demographics. One fun fact: the surveying tactics that the organization used were adopted by the U.S. Federal Census! There are many reasons why I love working with students who are doing archival research, but one reason in particular are the discoveries they make — which if it were me going through the boxes, might have been details I would have overlooked. 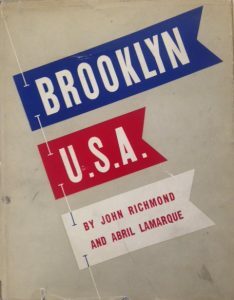 One such discovery (well there were several during this class session, but the one that stands out in my memory) was within this 1946 publication titled Brooklyn U.S.A. by John Richmond and Abril Lamarque, which I am pretty sure I came during my tenure at the Brooklyn Historical Society’s library and archives. 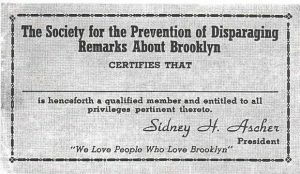 Inside this unassuming but eye-catching publication we are introduced to Sidney Ascher, the president and founder of the “nondues-paying” Society for the Prevention of Disparaging Remarks Against Brooklyn. This entry was posted in Archives, Collections, History on October 13, 2016 by Elizabeth Call.